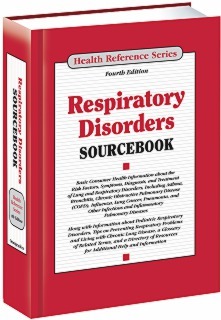 Respiratory Disorders Sourcebook, 4th Ed. Respiratory Disorders Sourcebook, 4th Edition describes infectious and inflammatory diseases of the respiratory system, including asthma, COPD, influenza, pneumonia, and C, and other conditions that impair breathing. Causes, triggers, diagnosis, and treatments are discussed. The book also includes sections on respiratory problems in children, and living with chronic lung conditions. The book is organized in the broad subject areas detailed below. Parts focus on broad areas of interest. Chapters are devoted to single topics within a part. Part I: Understanding and Preventing Respiratory Problems describes the components of the respiratory system and how they work together to facilitate healthy breathing. It discusses factors that can impact respiratory functioning, including genetics, allergies, hormonal changes, and exposure to toxins and irritants. The part concludes with statistical information about common respiratory disorders in the United States. Part II: Infectious Respiratory Disorders discusses bacterial, viral, and fungal agents that lead to such illnesses as the common cold, bronchitis, influenza, ear infections, pertussis (whooping cough), pneumonia, sinusitis, tonsillitis, strep throat, aspergillosis, histoplasmosis, and inhalation anthrax. The part also offers tips for preventing the transmission of communicable respiratory diseases. Part III: Inflammatory Respiratory Disorders begins with information about the most common chronic respiratory disorder—asthma, which affects more than 17.7 million adults in the United States. In addition, the part describes other respiratory disorders that are characterized by inflammation. These include chronic obstructive pulmonary disease (COPD) and occupational lung diseases, such as those related to exposures to asbestos, silica, and mold. Part IV: Other Conditions That Affect Respiration offers information about disorders and diseases that impact lung function and the ability to breath normally, including cystic fibrosis, lung cancer, amyotrophic lateral sclerosis, and muscular dystrophy. This part also discusses lung trauma and lung-related emergencies that can be life threatening, such as pulmonary embolism and pulmonary hypertension. Part V: Pediatric Respiratory Disorders discusses the effect of specific respiratory disorders on children. These include asthma, which affects nearly 6.3 million children in the United States, croup, meconium aspiration, and respiratory syncytial virus (bronchiolitis). Part VI: Diagnosing and Treating Respiratory Disorders explains how pulmonologists and respiratory therapists treat and work with patients, and it describes common diagnostic tests, including pulmonary function tests and spirometry, blood gases tests, bronchoscopy, chest CT and MRI scans, and others. Information about commonly used medications, surgical procedures, and pulmonary rehabilitation therapies is also included. Part VII: Living with Chronic Respiratory Problems offers tips about minimizing triggers that contribute to asthma and other respiratory disorders, and it explains emergency action plans. Strategies for using common medical devices associated with respiratory care—including inhalers, peak flow monitors, and nebulizers—are also included. Part VIII: Additional Help and Information provides a glossary of important terms related to respiratory disorders and a directory of organizations that offer information to patients with respiratory disorders and their families and caregivers.